Hi everyone. 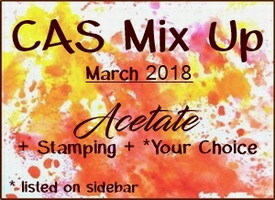 We are already over half way through the month, so this is a reminder of the CAS Mix Up March Challenge - Acetate, hosted by my talented friend Susan (Cardmaker's Garret). 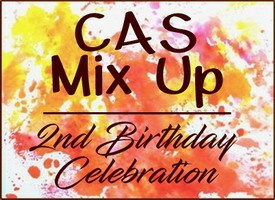 And it's also our 2nd birthday. Come celebrate with us. Prizes for Winner and one random draw of all eligible entries. I'm having fun with this challenge. Today's card uses acetate as a "window" for my card. I have used a wildflower stencil and white embossing paste over top of the clear acetate, and then sprinkled with iridescent glitter embossing powder. Once the paste was dry, I set the glitter embossing powder with my heat tool. I've attached the window to the inside of my card front and popped it up over a watercolour tissue paper background. This background was made by watercolouring tissue paper (see my video tutorial HERE) using Inka Gold. I've used slate blue and gold. It's pretty and shimmery. I stamped the sentiment (NBUS stamp set that I just bought) using a matching yellow gold ink. We are thrilled to have Cathy (Cathy's Card Spot) as our Guest Designer this month. Please check out the challenge blog to see Cathy's reminder acetate card, along with the reminder cards from the rest of our Designers. Then come play along! Fab background and a great idea to use the embossing paste with the glitter EP. I am not surprised you love this Loll - it's simply gorgeous! That background is so dreamy and the perfect backdrop for your stenciled flowers. Love this is so beautifully designed with your popped up window. I definitely want to case this one! This is so elegant. I love the flowers done with the paste. Hugs Mrs A.
I love this card so much - partly because it is blue and white, but mostly because I love the idea of using a stencil and paste with added glitter from the embossing powder - brilliant combination! It's been so much fun being on the DT for CAS Mix Up - I'm really going to miss it, but going to your Christmas challenge makes up for it! What wonderful depth with your embossing paste, acetate and tissue paper background! A beautiful wildflower garden, my friend! Love your Inka Gold in blue and gold over your acetate sheet and how you added the stenciled with white paste and glitter wild flowers. Gorgeous wild flower garden my friend. TFS Hugs.. Absolutely stunning Loll, your embossing is beautiful. I love the dimension of your flowers against the acetate. Another beautiful background Loll. Love all the different ways we can use acetate. Now I have just seen another - thanks to your gorgeous wildflower stencil. Must add this to my need to try techniques. Such a pretty card, Loll! I really like what you did on the acetate and the sparkle. The background really helps it to pop! Beautiful work!